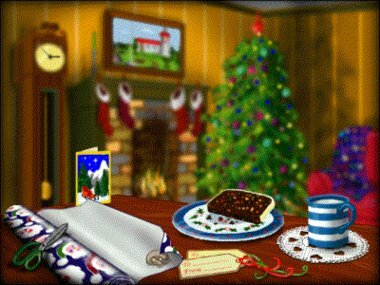 View a restful Christmas scene complete with a fireplace, a decorated tree, a working grandfather clock, a greedy mouse, and a soundtrack of fifteen MIDI carols. Christmas trivia facts are displayed at intervals. You can configure the interval between trivia and the length of time they display.